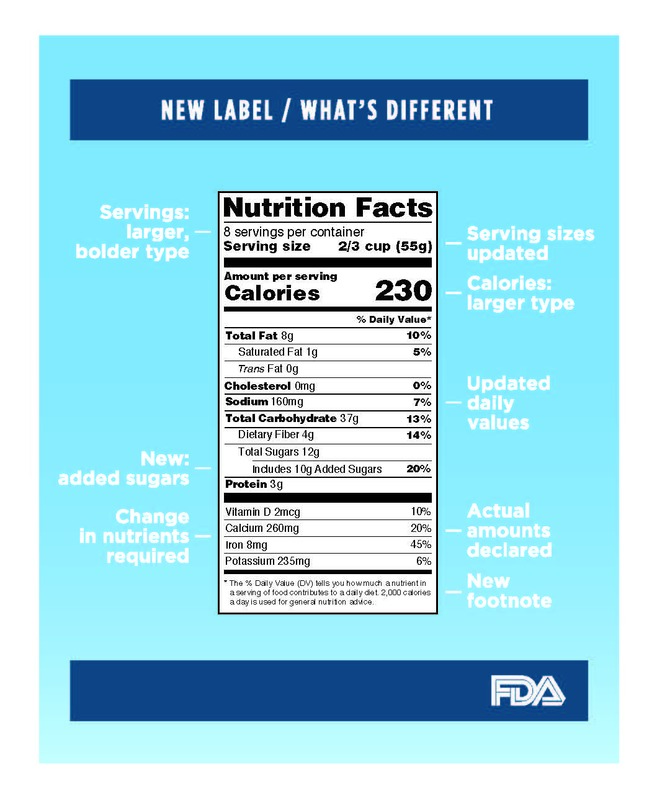 The U.S. Food and Drug Administration (FDA) has updated its Nutrition Facts label for packaged foods to make it easier for consumers to make more informed food choices. Total calories are now emphasized by a larger bold font size. The posted serving size now reflects what a typical American consumes instead of a recommended serving size. Packages that contain between one and two recommended servings, such as a 20-ounce soda or a 15-ounce can of soup, will list calories and other nutrients for a single serving because people typically consume the full amount in one sitting. Sugar totals now include a line depicting how much of the total sugars in the product come from added sugars. This is intended to help people limit added sugars to 10 percent of their total daily calories, which the FDA recommends in its 2015-2020 Dietary Guidelines for Americans. Vitamin D and potassium are now included because of their increased importance in nutrition science. Vitamin D deficiency is common and has been linked to obesity, and potassium has been shown to help lower blood pressure. 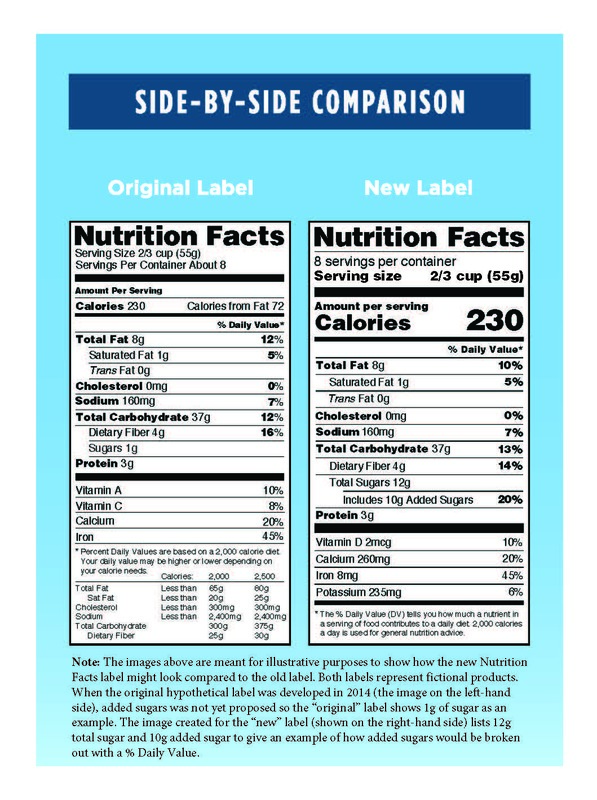 It's an improvement for the new label because it differentiates between natural sugars in foods that provide other nutritional value, such as fruits and milk. It’s difficult to get all of your nutrition when you’re getting your calories from foods with lots of added sugars. People focus less on what to avoid and more on choosing foods that contain the nutrients we need. It is important to embrace your healthy lifestyle including excercise, hydration, and a diet rich in whole foods in stead of only emphsizing nutrients listed on the label. Food producers have until July 26, 2018, to comply with the new rules. 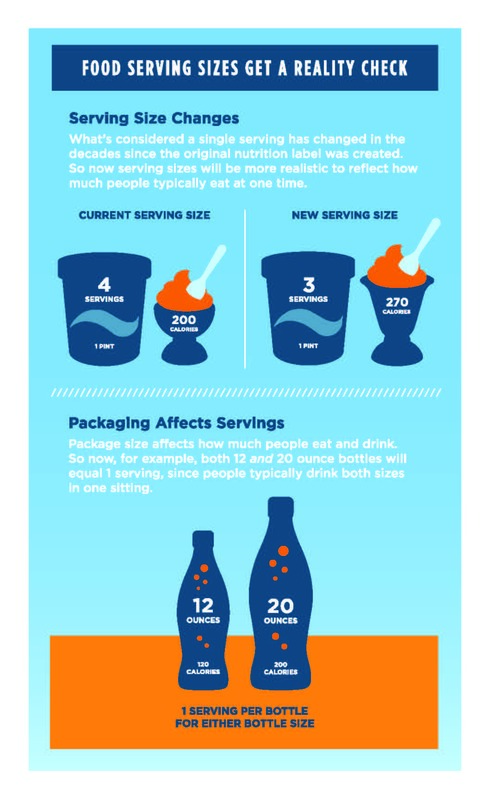 Take a look at the infographics from the FDA below to learn more about the changes or download a PDF of each graphic.